Although suppliers are influenced by firm-specific challenges, it is clear that certain market indicators affect all suppliers, allowing their behavior to be relatively predictable within the context of the market state. PowerAdvocate examined over 700 bid responses from 140 different transmission and distribution sourcing events as well as macro- and industry-specific economic indicators, and found that supplier behavior was predictable in three distinct market states: recession (2007-2009), initial economic recovery (2010-2012), and ongoing recovery (2013-2016). For instance, during the initial recovery period – when utility capital expenditures and US GDP began to increase after the recession – specialized suppliers’ (industry specific, geographically limited) range of bid responses decreased immediately while major suppliers (large, diversified firms) took longer to decrease. 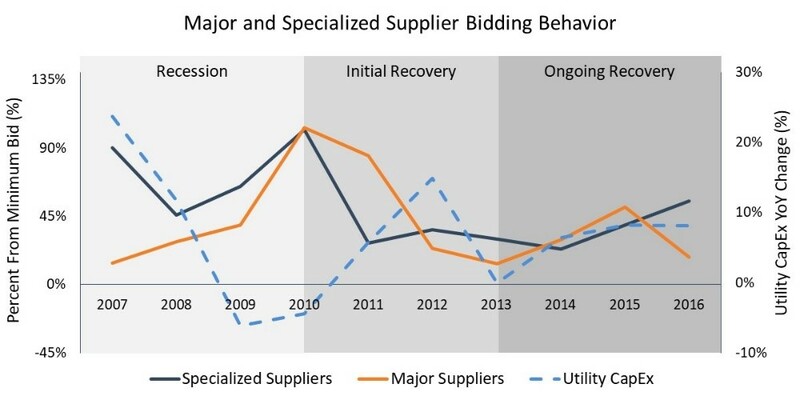 A well-positioned utility could rely on specialized suppliers to reduce the range of bid response prices and therefore reduce the potential of receiving exceptionally high rates. Insights like this and others presented in our whitepaper can help an organization identify behaviors in their own supply base and begin to reduce the risk posed by fluctuations in supplier bidding behavior. Read the whitepaper on how suppliers’ participation rate and range of bid responses changed during the past 10+ years and how you can limit your risk exposure and maximize value to your projects. This is first in our two part series of posts on how to reduce supplier risk by understanding your supplier bidding behavior lead by PowerAdvocate's team of Capital Project consultants. PowerAdvocate's Capital Projects consulting practice helps energy clients plan, source, and execute large, complex capital portfolios and projects across a wide range of industries. From helping design organizational approaches, leveraging market data to estimate and forecast project costs, procuring and negotiating large contracts, and implementing sophisticated risk-reward programs, the practice has added value to our clients' projects across North America, Europe, and the Middle East. Want to learn more about our Capital Projects Consulting Team ? Which factors help predict supplier pricing? Read our whitepaper, Anticipating Supplier Pricing Behavior to find out.